The Lighthouse Café is a nightclub located at 30 Pier Avenue in Hermosa Beach, California. It has been active as a jazz showcase since 1949 and, under the name "The Lighthouse", was one of the central West Coast jazz clubs from the 1950s through the late 1970s. In addition to jazz, music of many different genres, from reggae to rock, is now heard at the venue, including performances by local artists such as Jett Prescott and George Stanford. A restaurant called "Verpilate's" was built a short walk from the ocean at 30 Pier Avenue in 1934, and it was converted into "The Lighthouse", a bar, in 1940 ("Café" was added to the official name only when the business was sold in 1981). The club first began showcasing jazz music on May 29, 1949, when owner John Levine permitted bassist/band leader Howard Rumsey to start a recurring Sunday jam session on a trial basis. The experiment was a success. Rumsey became club manager soon after, and put together a house band called the Lighthouse All-Stars. While the club also hosted visiting groups, the Lighthouse All-Stars became a noted ensemble in its own right, which had among its guest musicians Chet Baker, Gerry Mulligan and Miles Davis. The longest-running members of the Lighthouse All-Stars were Bob Cooper (tenor saxophone), Conte Candoli (trumpet), and Stan Levey (drums). West Coast jazz stalwarts Shorty Rogers, Richie Kamuca, Bill Holman, Bud Shank, Shelly Manne, and Jimmy Giuffre were also regulars in the early days. Max Roach was the regular drummer for a while in 1953. The club also became an important venue for recordings; Art Pepper, Lee Morgan, Cannonball Adderley, Mose Allison, Ramsey Lewis, Art Blakey, Charles Earland, Grant Green, Elvin Jones, Cal Tjader, the Modern Jazz Quartet, The Three Sounds, the Jazz Crusaders, and Joe Henderson all made recordings there. "The Lighthouse" sponsored an inter-collegiate jazz festival in the late-1950s, and the competition's winners included Mike Melvoin and Les McCann. John Levine died in 1970, and his family sold the club to Rudy Onderwyzer, manager and part owner of Shelly Manne's club, "Shelly's Manne-Hole". 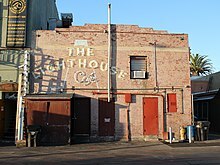 Rumsey left "The Lighthouse" in 1971 to open the "Concerts By The Sea" jazz club in nearby Redondo Beach, and Onderwyzer sold the club again in 1981. The new owners remodeled it and mostly discontinued the jazz-music policy. From the middle of the 1990s, jazz slowly began to come back to the club, first on Sunday afternoons, then on a two-days-a-week schedule. 1953: Miles Davis and the Lighthouse All-Stars – At Last! (Contemporary, 1985) recorded same day as with Baker. "Lighthouse Café"/"Nightclubs and Other Venues". Grove Jazz online. This page was last edited on 3 March 2018, at 07:26 (UTC).